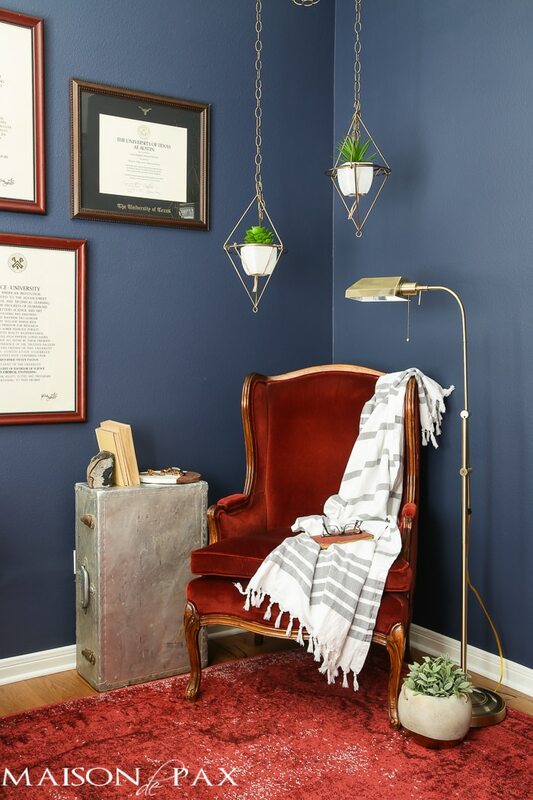 Hanging plants and a masculine wall color bring life to this reading space. Confession: we once had a 4′ x 8′ hole in our kitchen ceiling… for six months. I currently have painter’s tape around the light fixtures in not one but two rooms in our home. It’s been there since February, and in case you haven’t noticed, it’s almost July. So given my track record for glacial speed on some projects, I guess today’s post shouldn’t come as a surprise. In fact, maybe I should simply be proud of myself for my substantial decent progress on our dark and moody navy office space. First of all, I found this beautiful rug at hayneedle (and hayneedle was kind enough to send it to me… thank you!). Though red is usually a bit bold for my neutral-loving taste, I must admit that I’m enjoying it. If you remember, Mr. Pax requested a dark, moody study with a bit of a Sherlock feel (if you haven’t seen the very cool 221B Baker Street apartment of the BBC’s new modern Sherlock series, you should check it out). And me? Well, I love a challenge. 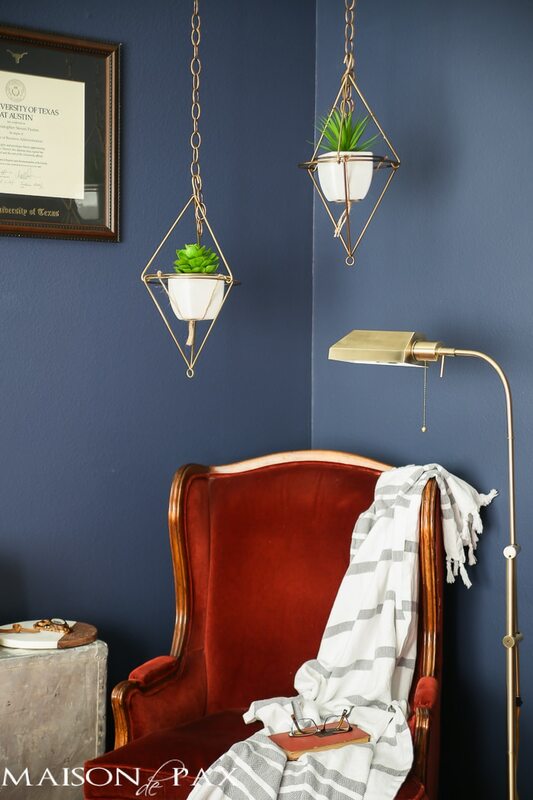 And honestly, I love so many design styles – including dark, moody, and quirky – so it has very much been a treat to create this space for him. A slow and deliberate treat, though, apparently. 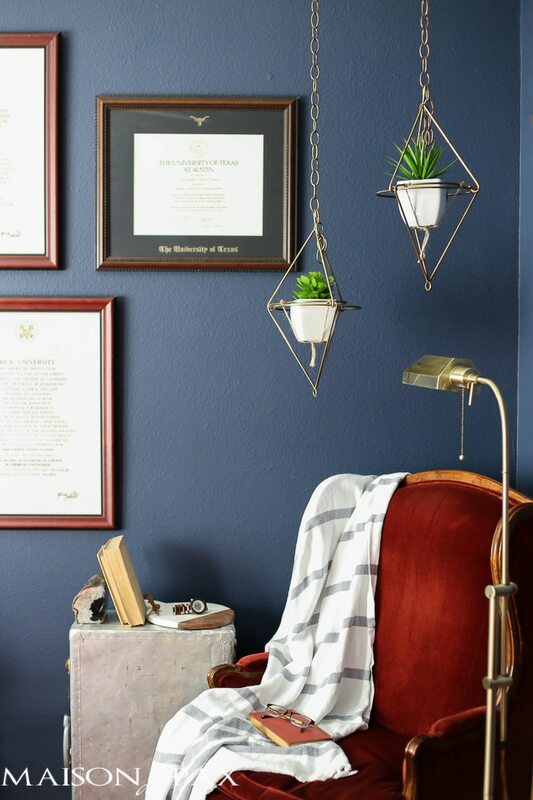 And, for the record, the blue feels much darker in person – more navy, less gray… but I’m still working on my navy wall photography skills. But I digress… Accomplishment 1: new rug. 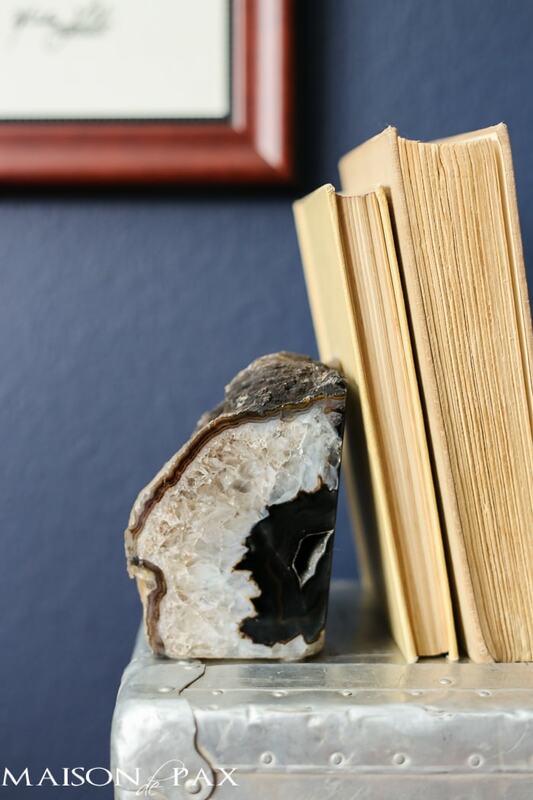 Accomplishment 2: a reading corner. We already had this fabulous vintage chair (a Craigslist find a few years ago). It needs new filling in the cushion, but I haven’t gotten around to that yet, and Mr. Pax doesn’t seem to mind. The chair gives that kind of masculine smoking jacket look that I think is perfect for this style. 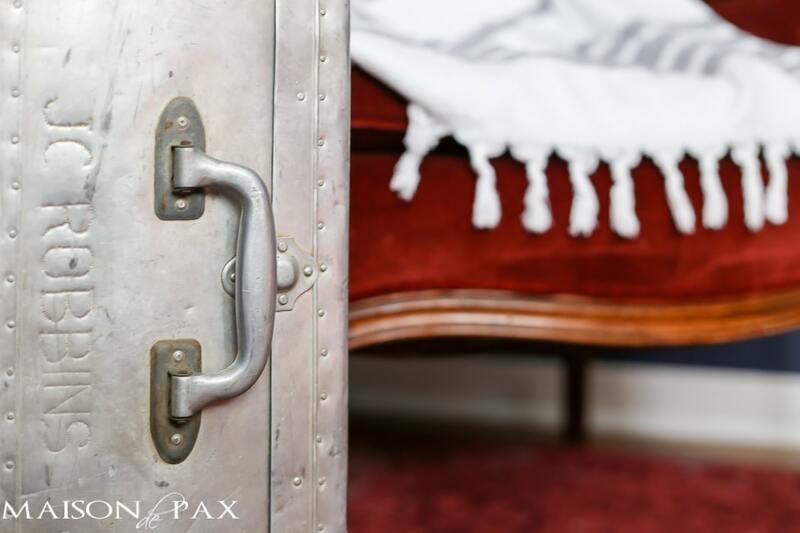 And when I spotted this vintage suitcase at the local antique mall, I thought it would make an excellent little side table for his books and a cup of coffee. It’s too small for a lamp, though, so this floor lamp (also from hayneedle) was the perfect solution. 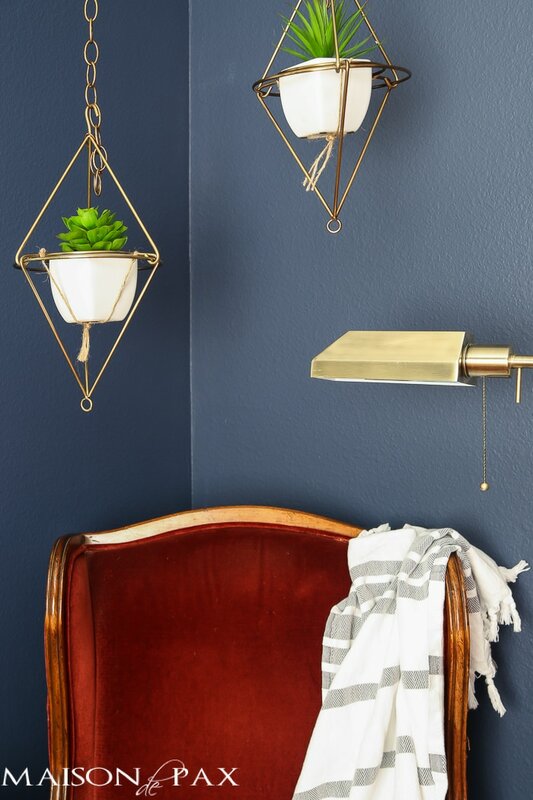 The height is perfect for the chair, and I love the brass finish and the little pull down chain. 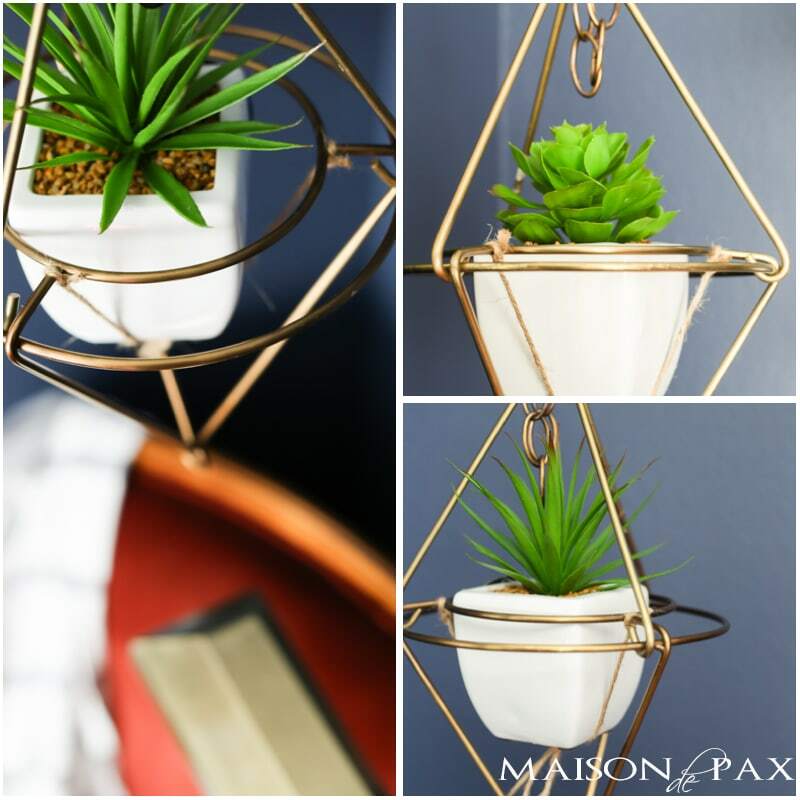 These awesome plant hangers were on sale for $10 each, and I knew exactly where I wanted them to go. After we hung up all the diplomas (and, yes, we have lots… we are officially self-proclaimed nerds), I needed something a little whimsical to balance it all out. 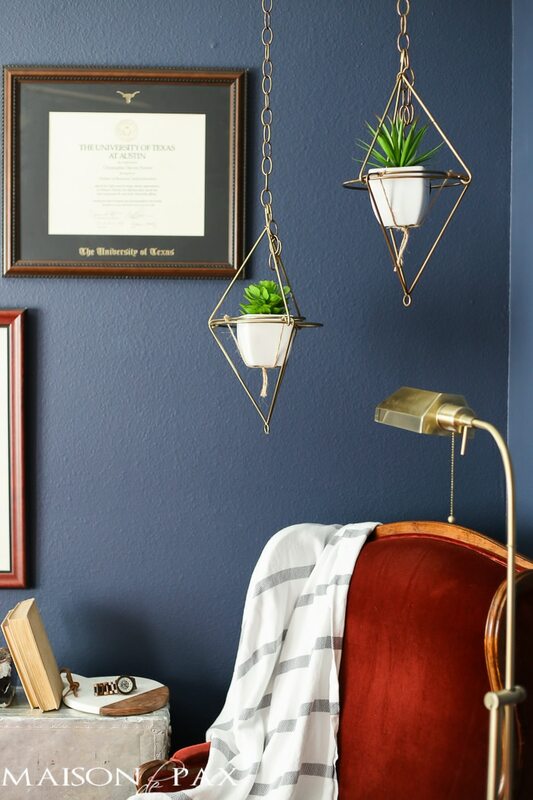 I used a basic chain from the hardware store (to which I added a little Rub n’ Buff) to hang them. 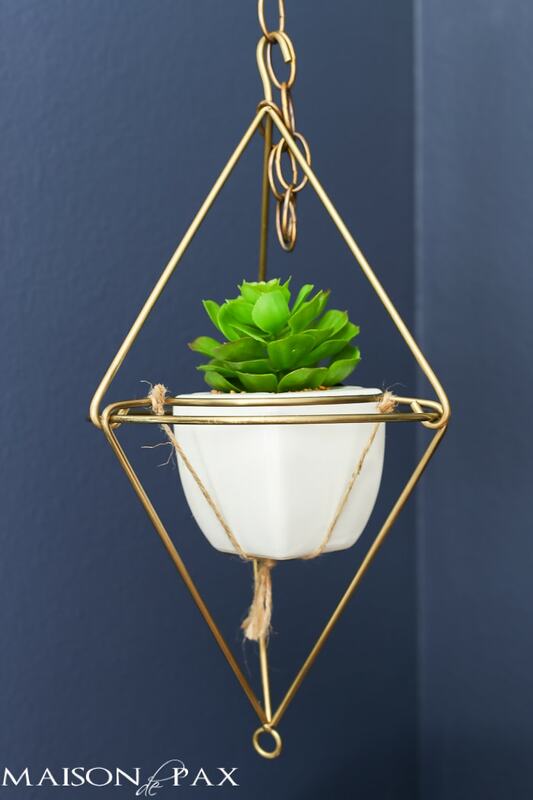 And though the holders will fit a 6″ pot perfectly, I liked the size of these little white pots better, so I used a little hemp twine to hold them in place. I love the modern, angular look in contrast to the traditional curves of the chair. 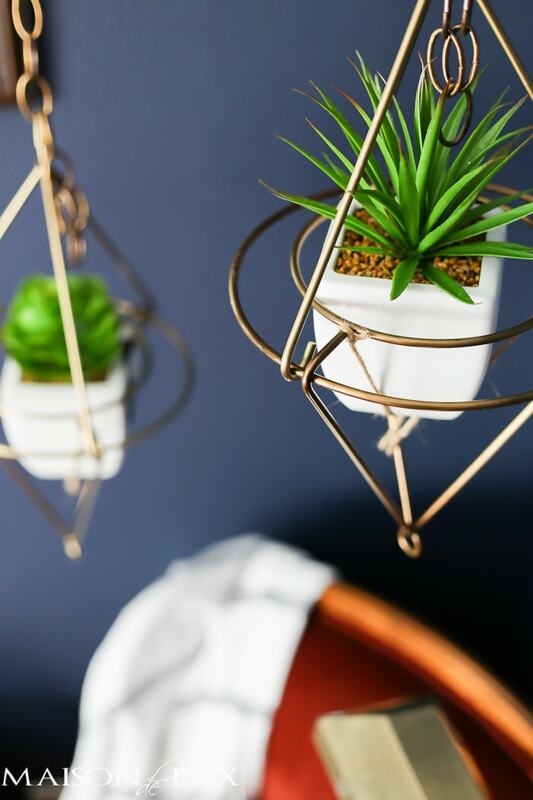 And – as you well know by now – I love adding plants to every space, preferably in a creative way. Disclosure: A huge thank you to hayneedle for providing the rug and lamp! As always, all opinions are my own; you can see my full disclosure policy here. I love what you have done,with all your assistants helping you shop and decorate looks wonderful. Happy 4th to you. Thank you so much, Marlene! !